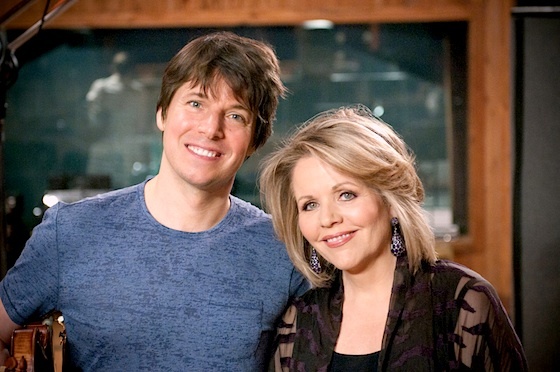 November 25, 2013, 12:57 PM · To tell the truth, Joshua Bell never really saw himself making a holiday album. "You get so much Christmas music on the radio around Christmas time -- I've never actually gone out and bought a holiday album myself!" Joshua said to me over the phone last week. "And I never thought I'd be making a holiday album." It came together after a few collaborations, which just happened to be for holiday tunes: "I had done 'White Christmas' with Chris Botti, and 'O Holy Night' with Kristen Chenowith. I really enjoyed those, and I thought: There's a theme there…"
With several tunes already in the bag, why not expand on the idea? Joshua's new album, Musical Gifts, features familiar holiday music -- classical, sacred and secular. Its wide range reflects Joshua's mixed background -- his late father was a former Episcopal priest and his mother is Jewish. "The holidays for me was always a mix of Hanukah and Christmas," Joshua said. "I wanted to create a body of work that celebrates both traditions and captures the feeling of the holidays. I associate the holidays with music in my house. Around Christmas time, everyone would come visit, or we'd visit them. We were spread around, from Canada through the U.S., so it wasn't always in the same place. But it was always an occasion for music. Everybody had an instrument -- everyone played something in our family. So Christmas was about playing music together." Joshua had resisted the holiday-music genre in the past "because sometimes they seem a little churned-out, just to capitalize on the holidays to sell records, and I really never wanted to do something like that," he said, "but this is actually a very musically interesting project for me." Joshua had seriously interesting musical collaborators: Gloria Estefan, Alison Krauss, Kristin Chenoweth, trumpeter Chris Botti, jazz artists Chick Corea and Branford Marsalis, opera stars Placido Domingo and Renee Fleming; Michael Feinstein, Frankie Moreno, a cappella group Straight No Chaser, cellist Steven Isserlis, and classical comedy duo Igudesman-Joo. Joshua was inspired by the idea of creating duets with so many artists, in such a mix of genres. And there's a lot of creativity in there: a "Christmas Confusion" parody with comedy team Igudesman and Joo; a Nutcracker medley with the a cappella choir Straight No Chaser; a rather blue-grass-sounding "God Rest ye Merry Gentlemen" with Alison Krauss, and "Silent Night" with the Young People's Chorus of New York. "I've done things with lots of different kinds of musicians before; I really enjoyed making the album called At Home with Friends, and this is sort of a continuation of that idea," Joshua said. "I just enjoy the challenge of working with great musicians like Chick Corea and Branford Marsalis. They're improvising, and each take is something totally different. I just get inspired by that." Joshua met Chick Corea at the Verbier Festival, when he was doing a concert with Bobby McFerrin. "They actually dragged me up on stage during their concert and made me try to improvise Summertime with them," he said. "So we've met several times over the years, and I've always wanted to work with him. Same with Branford; Branford and I have done some songs for various galas and charity concerts, but we've never recorded together. When I did this album, it was an opportunity to call on all these people that I've met over the years. (Plácido) Domingo, for instance, is someone I've gotten to meet over the years but never gotten to work with, so it was a fun opportunity to just send out some calls, see who would agree to be on the album. I got a lot of nice responses." How did he select the songs and do the arrangements? In many cases the ideas came from the artists. In fact, Joshua had never heard "I Want an Old-Fashioned Christmas," the song Renee Fleming did on the album. "It was one of her pet pieces that she wanted to do," Joshua said. "So we made little duos of all these pieces, and the arranging process was a lot of fun," Joshua said. "There were several arrangers on the album, but one of them was a new discovery for me, Rob Moose. He arranged the first two songs on the album. 'God Rest Ye Merry Gentlemen' was a very sweet arrangement, the one with Alison Krause. He also arranged 'Let It Snow,' which I performed with jazz guitarist Julian Lage. Rob actually plays the violin as well, and guitar and other instruments." Did Joshua help with the arrangements? "I'm a kind of wanna-be composer, so I love working with them, fixing the parts up and making it more violinistic," Joshu said. "The one that I had the most responsibility for was 'I'll Be Home for Christmas' with Frankie Moreno. I've worked with him before; we did a version of 'Eleanor Rigby.' We just get in the room and we just start fooling around and improvising. It starts to take shape in an arrangement, and that's really a lot of fun for me." "My six-year-old, Josef, plays the cello, and in fact, he and I played together for the first time last night," Joshua said. "I had a benefit for his school in my apartment, a little concert, and I brought him out and we played a duet together. It was the first time we've ever played together, a Mozart Romance, a little piece that was in his book, so it was very sweet. We're not at the Brahms Double yet!" Joshua will perform a number of the songs from his new album in a "Musical Gifts" concert at 7 p.m. EST tomorrow (Nov. 26th), and it will be webcast on Medici.TV. Besides Joshua, performers will include Renée Fleming, Michael Feinstein, Frankie Moreno, Rob Moose, and the Young People’s Chorus of New York City. Plus, you can get a peek inside Josh's cool two-story Manhattan digs. "It's going to be broadcast from my house, because I really enjoy having concerts soirees in my apartment, in fact I designed my apartment around that idea." And now, for some holiday humor, featuring Joshua with Igudesman and Joo! 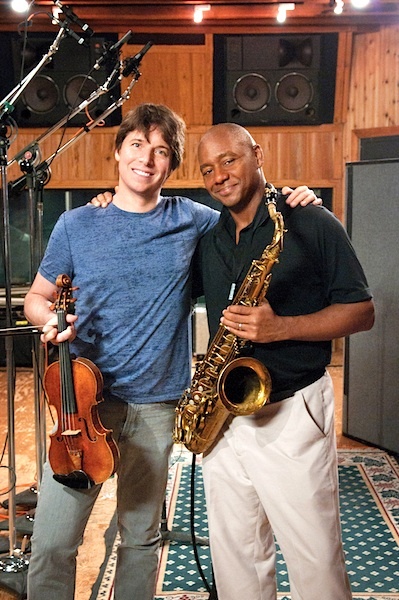 November 29, 2013 at 11:22 PM · Does anyone else think Joshua Bell and Ken Burns were separated at birth?